Proposition #6 – That Alleged S.W.A.T. 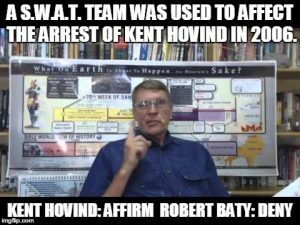 Team – Kent Hovind v. Robert Baty – The Great Debates! Kent Hovind and his people have for years been making the above claim with nothing being submitted to support it apart from the ipse dixit. In today’s edition of The Monroe Journal, Ernie Land, Kent’s man, has indicated that I was correct in my position and correct in calling Kent to account for this most popular claim of his and his people. How many times have “we” seen the pictures of S.W.A.T. Teams in Hovind articles to dramatize what was alleged regarding Kent and his arrest. Really! Those “many people” never came forward to be examined about any such claims. I think Ernie is admitting, implicitly, that Kent’s and his peoples’ years long claims have been knowingly false all along. So many of Kent’s claims, and those of his people, appear to be of this same basic character; false.